In the past few years, we’ve noticed tremendous growth in the cryptocurrency market and the number of companies and startups offering cryptocurrency and blockchain based products. This has opened up several opportunities for VCs. The first is investing in the crypto market and blockchain space. Venture investments in the crypto market and blockchain startups exceeded $1 billion between 2013 and 2016, with $290 million in H1 of 2016 alone. This asset class continues to outperform traditional investments like stocks, bonds and precious metals. In the past few months, there have also been a number of companies leveraging this growth by offering cryptocurrency based products such as exchange traded funds (ETF) tied to cryptocurrencies. Investment funds are also employing a variety of strategies such as purchasing the top 10 coins by market cap, only investing blockchain incubators or focusing on real estate investment trusts (REIT). We’ve found these to be great opportunities for investors looking to move into the crypto market. The other opportunity VCs should be educated on is the trend of fundraising on the blockchain. 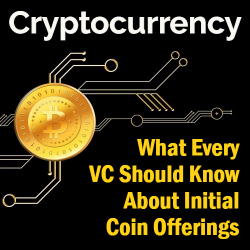 We’re seeing more and more startups are using an initial coin offering (ICO) or token sale to raise capital and avoid many of the drawbacks of traditional fundraising. According to CoinMarketCap.com, there has already been over $3 billion raised through ICOs in 2017. Before we dive too deeply into the specific benefits and challenges of fundraising on the blockchain, it’s important to understand the distinctions between some common crypto terms. Cryptocurrencies: Cryptocurrencies are a form of digital currency or virtual currency. Bitcoin and Ethereum are the two largest decentralized cryptocurrencies. These currencies use cryptography to secure transactions and control the creation of additional coins and blockchains to verify and keep a record of transactions. Blockchain: The blockchain is a distributed digital ledger that is broadcast to a network of nodes to record and verify the ledger’s accuracy without the need for a central repository or administrator. The creation of bitcoins was the first use of the blockchain but is isn’t the only use. Essentially, blockchain technology can be used by any company to create and manage their own cryptocurrency or any other financial transactions or other data. Initial Coin Offering (ICO): Through the use of blockchain technology, a company can issue an ICO by creating their own cryptocurrency and offering it for sale to investors in exchange for legal tender or other cryptocurrencies such as bitcoin. Ethereum: Not only is Ethereum the #2 cryptocurrency behind bitcoin, it also offers a distributed public blockchain network that can run the programming code of any decentralized application. Through Ethereum’s open source ERC20 protocol, companies can create their own tokens on top of Ethereum and execute their own smart contracts which are run and verified on the blockchain. This ability to facilitate exchanges without the possibility of fraud or third-party interference is why most ICOs are run on the Ethereum engine. Ripple: Ripple is a Google-backed start-up that uses blockchain technology to settle financial transactions. Since its introduction, banks that are using Ripple have seen a 33% reduction in operating costs. SALT: SALT is a lending platform that gives you the opportunity to obtain blockchain-backed loans. This can be beneficial for startups after their ICO. through companies like SALT. Civic: One challenge companies fundraising through blockchains have run into is the need to obtain Know Your Customer (KYC) information in a traditionally very anonymous cryptocurrency market. Civic is an identity verification system that allows anyone to give and receive KYC information through a trusted source. The KYC information is then stored in the distributed ledger of the blockchain. Whether your company is blockchain related or not, you can still benefit from the boom of blockchain startups by raising funds through your own ICO. With the boom of the cryptocurrency market, we’ve seen much higher interest generated by ICOs than any other asset class, and 2017 has been a record year. The Bancor Foundation raised $153 million in 3 hours through their ICO. TenX raised $34 million in the first 7 MINUTES of theirs! Right now investors are very interested in startup ICOs. An ICO also offers access to a much larger, global market than traditional fundraising options which may limit you. 90% of North American and European banks are exploring blockchain. Opening your opportunities to a global market of investors can really give your ICO legs. Despite the increased reach of an ICO, we’ve found they end up being a lower cost option as well. The other thing many investors look for – which many traditional asset classes fail to offer – is liquidity. For example, real estate investors have always struggled with illiquidity premiums and the inability to exit investments for a number of years. By tokenizing your investment opportunity you can add liquidity to traditional asset classes and make them a much more valuable opportunity. There are a few major challenges when raising funds through a blockchain. None of them should turn you away from the idea of an ICO, but they should all be considered and planned for early on in the process. Evolving Tax and Compliance Laws: We expect laws surrounding cryptocurrencies and blockchains to change often over the next few years. Governments are still developing their definitions of the crypto market and where it falls in terms of tax and compliance laws. Jurisdiction: Since the laws surrounding cryptocurrencies are evolving, it can be difficult to choose the right jurisdiction for your tokens to fall under, especially when some jurisdictions will consider your coins a security. We’ve found Switzerland, The Cayman Islands, Estonia and the State of Delaware to be the strongest options, but your needs may vary. Correlation to Bitcoin: The global cryptocurrency market does have a strong correlation to bitcoin value. This makes it more difficult to diversify across cryptocurrencies. The cryptocurrency and blockchain markets are definitely in a state of rapid change. This can make the idea of fundraising on blockchain through an ICO seem like more of a challenge than it is worth. However, as a VC you know that just presents an even larger opportunity for those willing. There are as many as 5.8 million unique users using a cryptocurrency wallet and the cryptocurrency market cap sites at over $175 billion as of October 2017. That is definitely an opportunity worth seizing. Kirill Bensonoff is a successful entrepreneur with multiple exists, blockchain investor, product manager at Kaseya and partner at Caviar, pioneering a dual-purpose token and crowdfunding platform built on the Ethereum blockchain. He bought his first Bitcoin in 2013 and has participated in dozens of token generating events. As a graduate from the Entrepreneurial Masters program at MIT, he has served as both an advisor and angel investor in over 20 different companies. Kirill is a member of Young Entrepreneur’s Council and co-hosts the Boston Crypto Meetup series. He has been published or quoted in national business, blockchain and technology media, including Forbes, Inc., Huffington Post, Bitcoin Magazine and CoinTelegraph, among many others. Follow him on Twitter at @prankstr25.